Oppression takes many forms. When it takes the form of an all-seeing, powerful witch with the intention of enslaving the universe as in Ascender #1 from Image Comics then things are really, really rough. The issue is written by Jeff Lemire, illustrated by Dustin Nguyen and lettered by Steve Wands. Set ten years after the conclusion of the Descender storyline, magic has taken the place of machinery and the rules are very different indeed… Mila, the daughter of Andy and Effie from Descender, spends her days exploring the lonely wilds of the planet Sampson and trying to stay out of the clutches of the evil disciples of the all-powerful vampire witch known only as Mother. But, like her parents, Mila doesn’t like to play by the rules, and when a certain robot pal of her dad’s shows up, nothing will ever be the same! From the jump, Lemire sets the tone as extremely uneasy and slight spooky even with the (re)introduction of Mother as a very unsettling antagonist. Her mission is to ensure that the people of the galaxy bow to her control which is just enough of a forced ruling style that provides room for Mila to be an inspiring protagonist. Lemire is content to let Mother as a character dictate the overarching mood in the story because of her immense power and the deference that comes with it. The issue is extremely effective at introducing the reader to what's going on the world without being too blunt about it, giving the reader enough details to keep up but not so much that Lemire is holding their hand. The end of the first issue also has a requisite cliffhanger that's juxtaposed against Mila's growing discontent with her situation, proving that she'll likely play a much larger role as things unfold. 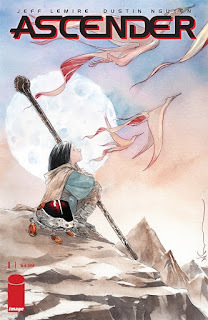 The watercolor art style by Nguyen seems a little strange at first, but as the story progresses it becomes clear that it's a perfect style for the narrative. There's a sort of uncertainty in the future of all the characters that's mirrored beautifully in the ambiguity of Nguyen's style. There's a lushness in the illustrations that makes the entire universe feel rich and lived in, doing wonders for the high fantasy setting. Nguyen relies on a dirty color palette of sorts that emphasizes browns, reds and greens throughout the issue--a fact that seems to reinforce the narrative of Mother being in tune with a greater power to channel her magic. The simple, gridlike panel layout also makes for a quick and breezy read, promising that the reader won't get lost amidst the fascinating world. Ascender #1 is a continuation of Descender, but it manages to feel like its own story entirely and not require the reader be familiar with the latter to fully enjoy the former. Mila is determined to change her lot in life, even if that comes with seemingly detrimental effects to her and her family. Lemire's script is extremely tight and well-paced, playing out beautifully and fostering an amazing world. Nguyen's illustrations are the perfect visual style for the story being told, blending technology and high fantasy together seamlessly. Ascender #1 is a great first issue that feels well-thought out and offers a lived-in world to enjoy. Descender is available April 24.